As an aspiring writer, I always thought that story was the most important part of a production, whether it be film, television, or, I don’t know, commercial video production. I stand by that to an extent still, as a great story should always be the foundation of any production. But when it comes to a finished product, I’ve come to believe that there is another factor that is actually the most important part of any production, that being sound. We all know the scene that acts as the central hub of the story of “Forrest Gump,” that being Gump sitting on a park bench endlessly droning on about his life experiences to poor unfortunate souls who just want to catch a bus. It’s here that we hear such catchphrases like “Stupid is as stupid does” and “Life is like a box of chocolates.” But the keyword there is … “hear. “ If the sound of surrounding traffic was too loud, or a plane was roaring by overhead, or Tom Hanks’ mic was all muffled, people may be saying “Strife is like a lot of dachsunds.” Frankly, that just may not be as quotable, and shows how truly pivotal sound is to a production. Firstly, the title of this section refers to a Beatles song, if you don’t know it, it’s awesome. Anyway, when talking about sound in a production, there are two major categories all sound falls into, being diegetic, and non-diegetic. Just kidding! While I don’t like to commonly tout our superior knowledge of video production (not too commonly), I’m well aware that you may have zero idea what those two words actually mean. Diegetic refers to the sound occurring within a scene, while non-diegetic refers to sound not actually in the scene. Non-diegetic sound is Rocky's jam! Non-diegetic can be summed up pretty well with soundtrack and scores, whereas there is a proverbial cornucopia of types of sound when it comes to diegetic sound. If you were to talk to any experienced sound technician or designer about the concept of silence, they would probably openly mock you to their sound posse, and you may be in for a soundage poundage. Because silence, absolute, total lack of sound, really doesn’t exist. Don’t believe me? Just take a moment, sit back, close your eyes (yes, in a rare instance, I’m telling you to stop reading my blog) and just listen. Try not to make a sound. You’ll find that the concept of absolute silence is kind of hokum, as you’re bound to hear something. If you’re near a window, you’ll hear shenanigans going on outside; a dog barking, cars passing. Even if you’re in the deepest recesses of your house, in the nuclear fallout bunker you’ve built in your basement underground, you’ll still find that you may be hearing your pipes, your air conditioning, the house settling, the multitudes of rats in the walls; there’s going to be something there. So, to create a realistic and fluid sound experience for your viewing audience, you’ll need to capture these non-sound sounds, because even though the audience may not be aware of these concepts, they will notice the difference between them being there and not. Foley, as it’s commonly referred to in production, is the reproduction of common sounds to increase the auditory experience of viewing a production. What good is an action movie going to be if you can’t hear the punches?! What makes an onscreen glutton seem more gluttonous than hearing the crunching and squelching of their chewing? That typing that we talked about earlier, that the inexpressibly attractive blogger was doing for the studio where he works, wouldn’t sound like typing without foley. Like almost every aspect of production, sound gets some tinkering in post-production. It’s not like a production is shot and all the sounds recorded in that scene are used as is; they’re either modified, or outright replaced with foley. Some people can go the safer route and use more stock foley, but the real fun is where the foley artists go completely off the leash, and create sound in some seriously bonkers ways. 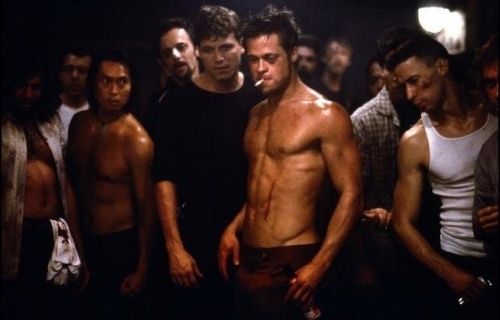 Take Ren Klyce and Richard Hymns, the boys behind the sound of “Fight Club.” I know that the first rule of fight club is to not talk about fight club, as is the second rule, but it’s worth noting in this conversation. Brad and I work out together. Now, clearly there already exists a bajillion (yes, exactly one bajillion) different stock punching noises the pair could’ve used, but they decided they really wanted the brutality of the film’s fight scenes to, pardon my punching pun, land. So they took the carcasses of chickens, stuffed them with walnuts, and just wailed on them. The following meaty yet crunchy sound effect is what was used in the film, and if you’ve seen “Fight Club,” you know that is a brutal movie. Mission accomplished, boys. Fun Foley stories like that abound in film lore; a pistachio was smashed against a metal plate to simulate the sound of a human skull being crushed in “Terminator 2: Judgement Day;” for the sound of Freddy Krueger's bladed fingers scraping together, a scalpel was rubbed against a machete; the sound of E.T. moving is combination of liver in a flat container, popcorn in a bag, and jelly wrapped in a wet towel (gross). But Foley doesn’t have to be used to create outrageous sounds; as we mentioned, it can be used to enhance certain sounds as well. In last year’s “Phantom Thread,” the main character, a petulant uppity man-child, is supposed to throw a temper tantrum because his girlfriend is making too much of a racket at breakfast … while scraping butter on her toast. But the sound designers for the film went out of their way to find which toasted bread would maximize that sound and get it as loud as possible to really make the sound pierce the scene. After going through a vast array of breads, they decided that white bread, toasted to dark brown, was surprisingly loud, and used that in the scene. Imagine that job, people getting paid thousands of dollars … to scrape butter on bread. What a life that must be. We’ve had many blogs over the years where we’ve gone over the more underrated and unappreciated aspects of production, such as framing and composition, blocking, and color, but sound is perhaps the most important aspect. I guarantee you, even if a production is just a sight to behold, and you’re basking in the glow of its beauty, you definitely won’t enjoy it if the sound is uneven, unedited, or sloppy. It would be like meeting a beautiful person, but when they open their mouth they say just … astonishingly stupid things. A bit of a turn-off, right? So next time you’re watching a movie, listen for the smallest things, whether it’s a footstep, a sniffle, or even nothing, with silence itself. Behind every one of those sounds was a tremendous effort. Thanks for reading again this week dudes and dudettes, and if you were picking up what I was putting down feel free to check out our other blogs on our website! We’ll see you guys next week!